Early Learning Express is based on the concept that children are naturally curious and truly enjoy learning, as long as they are interested. Children learn best through hands on experimentation such as painting, art activities, pretend play, stories, music, sand and water play, writing, games, puzzles, blocks and other construction activities. Children also need teachers to introduce topics of interest and to create fun and developmentally appropriate activities that influence children to learn and grow. Thinking skills are developed through language as children are encouraged to describe their experimentations. Children learn as they play and the teacher acts as a facilitator for the learning experience. By making learning fun, the program aims to instill a lifelong love of learning. Jennifer Bears has taught, observed and studied young children in an educational setting for the past twenty years. She founded Early Learning Express almost a decade ago. Jennifer's pedagogical philosophy has been built on her studies at the UVA, George Mason University, and the Virginia SOLs. She combines this academic groundwork with her practical experience from helping to establish an Even Start Literacy program, designing and implementing a phonological awareness curriculum for young children, work experience in private schools, Falls Church City kindergarten and Special Needs Pre-school and the Fairfax County Schools Head Start program. 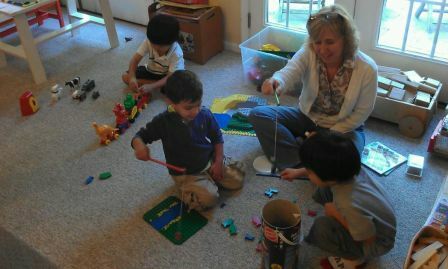 Her extensive work with children positions Jennifer as a well-regarded expert in childhood development and Early Learning Express as a premier establishment in the Northern Virginia community.